Philately is stamp collecting. If you don't collect stamps, this probably won't mean anything to you. A club asked me to make this editorial comic for their newsletter as it describes an issue of current debate. Oh, and since my image scaling code is based on the width of the three frame comics, this one will appear huge until I rewrite the code. 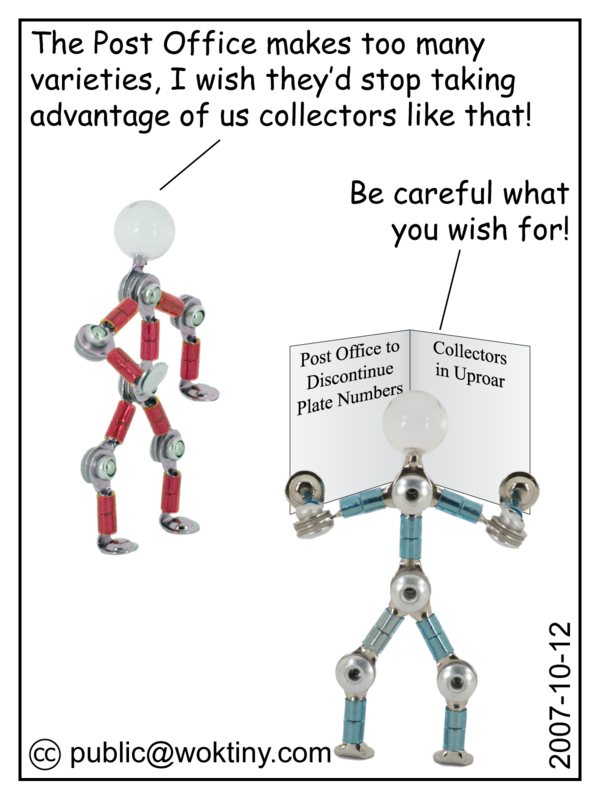 Red: The Post Office makes too many varieties, I wish they'd stop taking advantage of us collectors like that! Blue: Be careful what you wish for! It seems stamp collectors will just have to go back to collecting stamps. Character acrobots by Hog Wild purchased at ThinkGeek. These comics licensed under a Creative Commons Attribution-Noncommercial-No Derivative Works 3.0 License. This means you're free to copy and share these comics (but not to sell them or alter them). Copyright © 1980-2019 WokTiny. All rights reserved, except were otherwise stated.